Two under-the-radar teams looking to break through to the 6A quarterfinals will meet in Lawrence where the host Chesty Lions will entertain the Shawnee Mission North Indians. This game is a rematch of a Sunflower League game played back in Week 2 won by Lawrence 52-26. In that meeting, Lawrence rushed for 430 of their 610 yards of total offense. Senior running back Trey Moore rushed for 237 yards and three touchdowns, while quarterback Dante’ Jackson added 105 rushing yards and four scores. Jackson also passed for 180 yards. 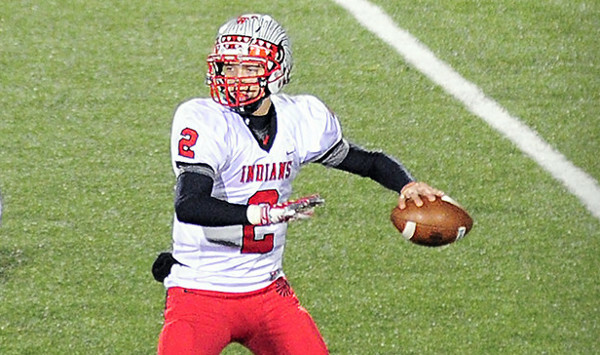 Shawnee Mission North senior quarterback Will Schneider passed for 299 yards and a touchdown in the game. On the season, Schneider (6-4, 205) has passed for 2,388 yards and 25 touchdowns against only five interceptions. He’s also added 500 rushing yards and ten scores. Schneider is closing in on the all-time state record for career passing yards of 8,781 held by Silver Lake’s Kyle Kruger. Schneider now has passed for 8,302 yards and 77 touchdowns on his career; 479 yards short of the state record. Last season against Lawrence High, he passed for more than 450 yards in the game. Last week, Lawrence forced six turnovers en route to a 51-12 win over Blue Valley West. The Lions recovered five Jaguar fumbles and intercepted a pass. Moore continued his standout senior season with 128 rushing yards and five touchdowns on 17 carries. He also returned a kickoff 93 yards for another score. For the season, Moore has carried 169 times for 1,287 yards and 16 touchdowns. Against Blue Valley West, Jackson returned, after missing time with an ankle injury, to pass for 115 yards and a touchdown going to Jalen Dudley. Lawrence is still a fairly young team with just three senior starters on offense, but has more experience on defense with eight senior starters. They will need to use that experience to slow down Schneider and the Indians again. Free State will make one of the longest possible trips in Kansas football when it travels more than 330 miles to Garden City. It marks the first time the schools have ever played in football, though Garden City did play Lawrence twice before Lawrence split into two high schools. It is the longest trip in Free State football annals; the school has been in existence since 1997. Free State has played some teams from the Wichita area the last two seasons. In ’14-15, the Firebirds defeated Wichita Northwest both years by a combined 29 points. Then, Free State lost to Hutchinson, 42-14, in 2014, and 35-14 to Derby last year. Both the 2015 Northwest and Derby games came on the road. The teams have similar average scores. Free State is at 34-14, while Garden City is at 38-17. Free State senior Dallas Crittenden, a first-year transfer from Topeka Hayden, is 111 of 186 passing for 1,704 yards with 16 scores against five interceptions. Zion Bowlin paces the Firebirds with 764 rushing yards. Zack Sanders, a Missouri State commit, has 11 receiving scores and a pair of pick-sixes, along with three punt return touchdowns. Free State pulled away in the second half to defeat Wichita South, 52-14. Garden City defeated South, 21-6, earlier this season. Free State opened with a 41-40 home loss to Shawnee Mission West and also fell 34-21 at Park Hill, Mo., in Week 3. Since then, the Firebirds have won every game by at least 14 points. Last season, Free State opened 0-3 but then won eight straight and finished 8-4. This year, Free State tied Shawnee Mission East for the Sunflower League crown with 6-0 marks. However, the Firebirds played just two Kansas teams that finished with winning records with SM West and rival Lawrence (6-3). Free State won in the cross-town matchup, 56-7, in Week 9. Garden City was 3-0 against teams that finished with winning records with victories against Northwest, Dodge City and Great Bend. Garden City is much more reliant on its ground game behind senior quarterback Jesse Nunez and senior fullback Peyton Hill. Nunez, a three-year starter, has 1,277 rushing yards and 19 rushing scores. He is 75 of 152 passing for 1,066 yards with 10 scores against six interceptions. Hill, in just seven contests, has 676 rushing yards. Garden City, the WAC titlists with a Week 8 overtime road win versus Great Bend, is very strong up front. DeMarcus Elliott has 11 tackles for loss, second-best in the WAC. Garden City’s defense was easily the best in the conference. In games when Great Bend didn’t play Garden City, the Panthers averaged 43 points a contest. This game will likely come down to the second half and if Free State can hold down the Buffs’ running game, and most specifically, Hill. In the key Week 6-8 stretch that yielded wins against Wichita Northwest, Dodge City and Great Bend, Garden City outscored opponents, 62-20, in the second half as Hill cleared 100 yards in each contest. Last week, Free State permitted Wichita South to 40 carries for 59 yards. Lawrence finished with 45 carries for 227 yards in Week 9.